Landscape remodeling requires more than simply improving gardens and flower beds. It requires carefully redesign of outdoor structures both functional and aesthetic, with a mindset of balance and proportion that ultimately points every form back to the home as the preeminent feature on the lot. Outdoor buildings may need to be significantly renovated to appropriately reflect the features of the house. Hardscapes will often require resurfacing or complete reconstructions in order to better extend the sense of living space into the yard. Swimming pools and patios must also be redesigned in most instances to be truly proportional and complimentary to the size and appearance of the house and surrounding natural elements. Exterior Worlds takes this extensive and systematic approach to landscape remodeling because our experience has shown that home values significantly rise when the surrounding property is transformed into a unified reflection of the house itself. When new potential residents come to look at a home, they are going to look at more than the structure itself. They are going to also take a careful look at the front and back yard to make sure that they will enjoy living outside as much as they do inside. It is here that a home sale is often made or broken, because nothing looks worse than a landscape whose features may have been constructed well as structures and elements within themselves, but offer little sense of relationship to one another and therefore strike the sense with a lack of harmony. It is here that we can step in and help the Houston homeowner significantly raise property value and ensure the highest possible return on home purchase investment. 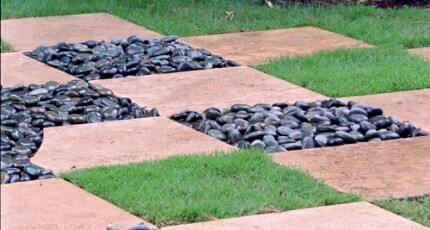 This is not always easily done at a low cost, however, due to the fact that there may be several major elements that need to be completely reconstructed in landscape remodeling. Homeowners may be looking at a sizeable investment in upgrade costs that may appear daunting in a time of recession or at a time when they have already begun to consider selling the house and moving on. For these individuals and families, we can help our services affordable by implementing it in phases billed incrementally within the budget of the client. One of the first things we take a good hard look at in landscape remodeling is the swimming pool. Normally, we find that the pool looks fine as a standalone structure, but was built disproportional and aesthetically inappropriate with the home and surrounding landscape. This creates a nagging sense of discomfort for anyone who looks at the property. They may not be consciously aware of the fact that the pool is disproportionate to its surroundings, but unconsciously they sense the imbalance and feel emotionally offset by its appearance. 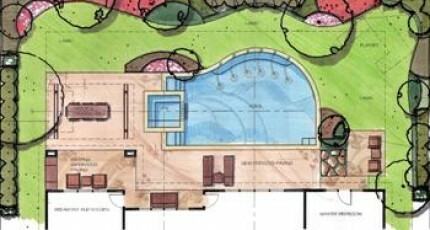 Because of this, Exterior Worlds almost always has to redesign the shape and size of the swimming pool and subcontract a new pool installer who will follow our new design with respect to the landscape master plan we develop prior to initiating any work in the yard. 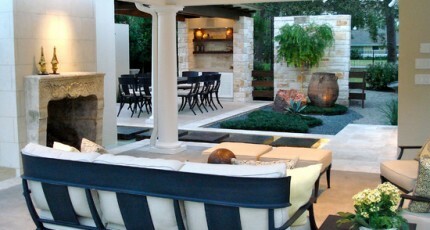 Renovating and rebuilding outdoor buildings is also a very significant component landscape remodeling. Most of these structures, like the pool, were probably built by very skilled construction specialists who were experts in architecture, but not necessarily in landscaping per se. We often have to significantly renovate arbors, outdoor summer kitchens, and outdoor dining rooms whenever we remodel a landscape. We want these outdoor structures to mirror the comfort and lifestyle represented by the home itself, and we insist on creating a sense of living space outdoors equivalent to that found indoors. Our landscape remodeling work also requires us to assess what landscape features could potentially add even more value to the property. Most homeowners are unaware of the extent that this can be done. Outdoor lighting can literally make a difference between night and day in any front or back yard. New parking areas and entry gardens can make the home more inviting and comfortable to guests. Private patios can be installed for couples to have their own separate space in the yard, along with special play areas for kids and sports courts for guests who want to do more than lounge in an outdoor room or sit by the pool. In the process of doing all of this there are some practical aspects to landscape remodeling that illustrate the absolute necessity of hiring the best and most experienced professional firm for the task. In any yard, there are going to be underground structures that must be worked around. Plumbing and pipes, underground utilities, and large tree roots are common to almost every property. Older homes that have undergone many renovations in the past may have many layers of such structures. Drainage and irrigation systems must either be designed or installed around these underground obstructions so as to not cause damage or impede operations. This requires a level of professional skill and innovation on the level that Exterior Worlds brings to the table. Again, we want to stress that every one of these things can be implemented in phases according to client budget, so that the homeowner is never stretched beyond their means in the pursuit of higher returns in the future. Ultimately the cost is well worth it when one considers the intrinsic return on investment that each phase of the project brings to home and property resale value.